Created a new Reviews Tab that includes this; added here as a Post to broadcast the news! "...highly recommended, though not for the faint of heart..."
So begins the debut novel of Massachusetts native and chemist-by-day Seth Lindberg. This decidedly dark fantasy is heavily influenced by Dante, Poe, Lovecraft, and a great love for weird tales. Opening the novel is the narrator, Dey, a seer and the stepson of Endenken Lysis. Endenken’s father, the leader of Clan Lysis, has recently died. In fact, much of Dey’s and Endenken’s world is dying. Humans and gods (both insectoid and avian) are infected with dyscrasia, a blood disease that is fatal to all who contract it. Endenken’s ancestors, the Picti, endeavored to save their gods through a complicated ritual that allows the Lysis clan to bear descendants who may eventually find a cure for dyscrasia. However, nothing is that simple. In the process of conducting the rite to pass his clan’s powers onto him, Endenken rejects his inheritance in favor of saving his wife and finding a way to end the blood plague. Outside of the works of Poe and Lovecraft, there are few, if any, novels comparable to this one. It has a bardic tone, as if it was a tale told over many nights. Beowulf comes to mind both for its epic quality and bloody action. "The pace is nearly breathless..."
Imagery shifts from mundane to surreal in the same paragraph. The pace is nearly breathless, though it never feels forced. Lindberg’s love of the English language and his admiration for Dante in particular are obvious on every page. The melancholic dread that Poe and Lovecraft were so skilled at creating is matched—and at times exceeded—in Lindberg’s prose: "I stared upward at a skull and heap of bones. I knew only the soul of a man spoke to me, and that astral, red warmth emanated from the charnel pile. A woman’s skeleton lay near—her hands gauntleted with insectan claws belonging to some eldritch creature and her head helmeted with a gargantuan bird skull, much like my own." Apart from a rather obsessive attachment to the words eldritch and ichor, Lords of Dyscrasia is carefully crafted and fits well into the weird-fiction canon. Given that Poe and Lovecraft have been dead for decades and still remain popular, Lindberg’s novel should find a ready-made audience in readers of the macabre and strange. Lindberg, who also created more than fifty illustrations and the cover for this book, makes the majority of current popular fantasy fiction read like recipes by comparison. 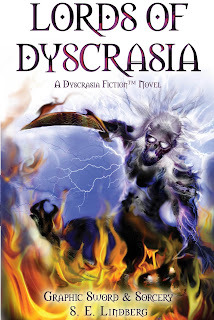 Lords of Dyscrasia is highly recommended, though not for the faint of heart. "...makes the majority of current popular fantasy fiction read like recipes..."
SEL: Literally, dyscrasia means “a bad mixture of liquids.” Historically, dyscrasia referred to any imbalance of the four medicinal humors professed by the ancient Greeks to sustain life (phlegm, blood, black and yellow bile). Artisans, anatomists, and chemists of the Renaissance expressed shared interest in the humors; accordingly, the scope of humorism evolved to include aspects of the four alchemical elements (water, air, earth and fire) and psychological temperaments (phlegmatic, sanguine, melancholic and choleric). In short, the humors are mystical media of color, energy, and emotion; Lords of Dyscrasia presents them as spiritual muses for artisans, sources of magical power, and contagions of a deadly disease; the book explores the choices humans and their gods make as a disease corrupts their souls, shared blood and creative energies. SEL: Correct. Lords of Dyscrasia is not for the young adult crowd. If the rating procedure for video games were applied, the book would probably be rated M for Mature; film rating equivalent would be R for Restricted. SEL: Sometimes words are limiting; sometimes drawings are too. A blend is nice for weird subject matter, since a goal is to describe characters or atmospheres in limited detail. Especially with weird fiction, artists must be careful not to reveal too much of the supernatural horrors since there exists an expectation that these subjects either (a) cannot be described fully since they are so bizarre and have never been described before, or (b) they can be defined well, but readers want to contribute and fill in details with their own imagination. Hence abstract drawing styles and poetic word choice work well for this genre, as they provide the expected blend of clarity and ambiguity. SEL: Yes. For better or worse, I still have more fears to share, and you can expect more Dyscrasia Fiction™. The sequel is in progress; the working title is Vivisecting Angels. I’ll be posting illustrations and excerpts on www.selindberg.com before its official release.